Marquand Editions in association with Veritas Editions is proud to release The Spirit Within: The California Missions, a limited edition book honoring the twenty-one California missions and their founding father, Junípero Serra, who will be canonized by Pope Francis in September of this year. 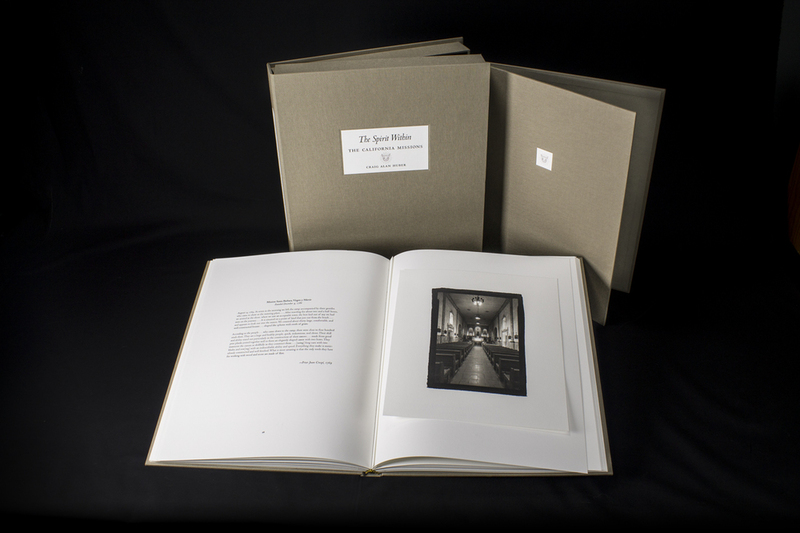 The volume includes twenty-two tipped-in original platinum/palladium prints and three loose platinum/palladium prints, all printed by photographic artist Craig Alan Huber using archival methods. Letterpress printing is employed throughout the book, which is housed in a custom linen-covered drop-face clamshell box and custom linen-covered loose print folio. The Spirit Within: The California Missions is limited to an edition of fifteen numbered and three lettered copies. The California missions stand as a testament to the perseverance, reverent evangelical zeal, and extraordinary fortitude that led Serra and his brother Franciscans from humble beginnings in Majorca, Spain, to life in the New World. Today, these missions stand as important monuments of both California state history and the history of the United States. Each mission has its own character and feel that makes it distinctive and worthy of notice. In a world that grows increasingly hectic and fast paced, these missions continue to offer sanctuaries of peace and tranquility. The Spirit Within: The California Missions features a foreword by Rubén G. Mendoza, PhD, RPA, CSU Monterey Bay and a frontispiece by Julianne Burton-Carvajal, PhD, historian. Accompanying the richly textured, carefully selected images in this portfolio are period commentaries by notable luminaries, whose observations and commentaries so presented provide the historic context and perceptions of a core sampling of the myriad artists, adventurers, missionaries, soldiers, and historians who have graced the hallowed halls of those twenty-one mission foundings and sacred sites that trace their pedigree to the first fathers of the California missions. At Marquand Editions, we delight in combining printing and binding techniques of the 19th, 20th, and 21st centuries to create volumes that make the best of new and old bookmaking methods. Books of this caliber take much more time to make—to print, to fold, to stitch, and to case in. This book was printed on a Vandercook 219 flatbed letterpress proofing press on fine rag paper. The pages were hand folded, stitched, and glued one spread at a time. The case, box, and folders were all handcrafted with fine cloth, threads, and endpapers. Veritas Editions believes in the truth in beauty and the beauty in truth. We publish premium limited editions and portfolios of photographic art to communicate our message. Drawing on equipment and techniques used by pioneering photographers from mid-nineteenth-century California for this five-year project, represented artist Craig Alan Huber repurposed a 5 × 7-inch Wood Field Camera and four lenses, including a circa 1860s Darlot Opticien Petzval. His choice of view camera equipment and well-honed professional techniques has produced a rich panoply of imagery that invites viewing the California missions in a new light—a transcendent visualization of the many sights and sounds that make up these many-storied places. For availability and pricing, please contact Veritas Editions at www.veritaseditions.com.